There are several techniques that you can try to organically rid your garden of squash bugs. Since some will work better than others in your individual circumstances, if one method doesn't seem to work, try another. Now that you know what squash bugs are and what they attack, you can better understand how to combat them. One of the most important things you can do is to isolate cucurbits from each other in your garden. Try not to plant more than two plants from the cucurbit list within eight feet of each other. This way, if you get an infestation in one set of plants, you may be able to save the others. Use organic pest control recipes to make your task quick and easy. You can also use these as a trap crop, meant to keep the squash bugs away from your zucchini and cucumbers. Allow the trap crop to grow as late as possible, long after your other cucurbit crops have been harvested. The bugs will be drawn to your trap crop and you can use 1% Rotenone or other method of killing them. This will greatly cut down on the number of bugs that infest your garden the next year. Planting varieties that are resistant to squash bugs can also help keep them from taking over your garden. By planting later in the season, you may avoid squash bugs completely. This can work very well in areas where there is only one growing season. It doesn't work as well in areas like the South and Southwest where there is more than one growing season. You can use gauze to cover your plants. This lightweight material keeps the bugs off your plants, but allows sun and rain in to them. Certain other insects are the natural predators of squash bugs. These will not kill off all the bugs on your plants the first season, but will cut back on infestations over the next several seasons. Using natural predators should be part of a program to get rid of squash bugs; it shouldn't be the only technique used. It is important to inspect your plants often and pick off the squash bugs, nymphs (immature stage), and eggs that you find. You can drop the bugs into a can of molasses. When you are done picking them off just put a top on the can and leave it out in the sun. By the next day, when you repeat the process, the previous day's bugs will be dead. Also, cut and dispose of any wilted or brown leaves, or any leaves that touch the ground. These are prime areas for the bugs to congregate. Do not put these leaves in your compost. Burn them or bag them and throw them away. You can spray neem oil on the plants that are susceptible to squash bugs. Use it every two weeks throughout the growing season. 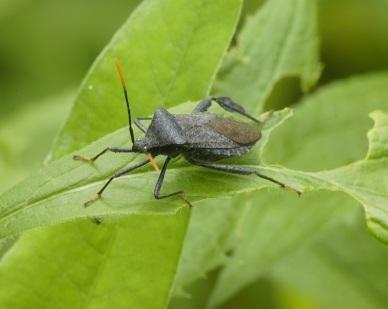 Squash bugs are a common problem, but you can get rid of them organically. It may take a few seasons, but you can get a squash bug infestation under control with some common sense and the commitment to implement the techniques and the tips given here.